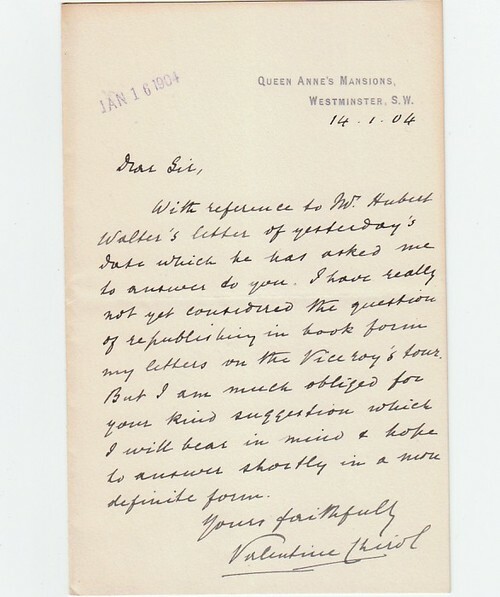 Autograph Letter Signed, addressed ‘Dear Sir’ [Edward Arnold, the publisher], thanking him for his suggestion, although ‘I have really not yet considered the question of republishing in book form my letters on the Viceroy’s tour’. 1 page 7 x 4.5 inches. Fine. London, 14 January 1904. Sir Valentine Chirol (1852-1929), traveller and journalist.